Hennepin Township High School "Mallards"
Hennepin (population 707) is located in northwest Putnam County in north-central Illinois. Illinois Routes 71 and 26 pass through town as does Interstate Highway 180. The mighty and historic Illinois River flows by Hennepin as does the Coffee Creek. The Conrail Railroad has tracks that are laid in Hennepin. For location sake, Hennepin is located about 10 miles southeast of Princeton. Hennepin was incorporated as a town in 1817. Due to its location on the Illinois River, it soon began to grow quite rapidly. The town hit what may have been a high of 2,144 residents in 1875. Hennepin is the county seat of Putnam County. It boasts of having the oldest functional court house in Illinois. The Hennepin Putnam County Court House was built in 1839. 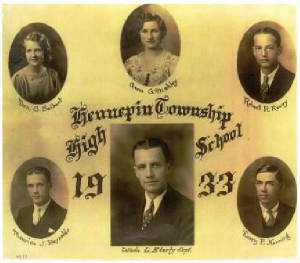 The Hennepin School system was established in the mid-1800's. The high school in Hennepin was functional from the late-1800's through the mid-1960's. The building shown above was erected in 1923 and was open as Hennepin High School until the early 1960's when the school districts of Putnam County decided to pool their resources into one large school district. This became a reality in 1966 with the creation of the Putnam County School District. The High School was located in nearby Granville. There is good news regarding the high school building in Hennepin. It is still operating as a school, now known as Hennepin Junior High School within the Putnam County School District. However, the fate of the original Hennepin High School building (prior to 1923) is also not known. Please e-mail us and share this information if you have knowledge of it. School Fight Song: "Mallards Take Wing"
Sung to the tune of "Anchors Aweigh"
We have always fought square. We will try to win --FIGHT to the end. We still will play to win. Hennepin High School definitely competed in boys' basketball (www.ihsa.org). It is probable that baseball and track were also offered. Some great rivalries were struck up over the years with its future schoolmates from Granville Hopkins HS and McNabb Swaney HS. Games were played at Deck Memorial Gymansium. If you have any further information on Hennepin High School's former athletic program, please forward it to us. The only mention of the Hennepin High School athletic program is of the District Champion of 1966, the schools last year of existence. There may have been many great Hennepin High School teams which did not win IHSA hardware. We would be glad to add these below if we are made aware of them. Some of the IHSA Tournament scores for Hennepin HS are listed below as found on the website "Illinois Postseason Basketball Scores". Serena lost in 2nd round. Earlville lost in 2nd round. Rollo lost in semi-final round. Scores for Hennepin from 1939 - 1950 are unavailable. Long Point won District title. Scores for Hennepin HS not available from 1953 - 1958. LaRose lost in title game. Scores for 1964 - 1966 not available. We are certain there were many other activities offered at Hennepin High School in addition to athletics. Choir, Band, FFA, FHA, plays, homecoming dances, and many other activities were likely a big part of the Hennepin High School curriculum. 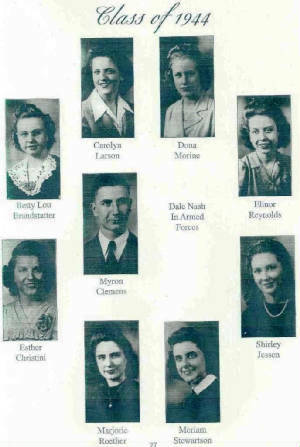 "Hennepin High School graduate Maurice Reynolds, shown with the other four graduates, is the sister of Marjorie Reynolds who told me that he attended the original school for two years (gades 1 & 2) and then moved into the HS building illustrated. The original building was still standing in 1932 but has been razed and is now the Ernest Bassi park. Ernie was with me in the boy scout troup my dad led. I graduated in l939."